I played a little with SVG images, HTML5 Canvas, and the SOP in Chrome trying to find ways to bypass the protection of the SOP and exfiltrate content cross-origin: Generally it is allowed to load images from other origins, as they are (by design) not governed by the SOP. With HTML5 Canvas it is easy to to render content like images or SVG in such a Canvas and derive a dataURL from it that can be sent to an attacker as Base64, which is simply the visual representation of the Canvas' content. So I thought of this as a way to exfiltrate secret content by putting it (via a malicious website) somehow onto a Canvas (cross-origin) and generating the dataURL from it to be sent back to me (as an attacker) in Base64. Of course a Canvas object is not allowed to be stripped into a dataURL as soon as it contains tainted content like images coming from foreign origins: So roughly speaking one can fetch an image from a foreign origin, put it onto an HTML5 Canvas, but then fetching the dataURL from that Canvas is prohibited by the browser throwing a tainted canvas security exception. At first I experimented in a malicious website with many different ways to load foreign (i.e. cross-origin) content into a Canvas and tried to generate the dataURL from it, which I could then exfiltrate. As expected, all interesting ways to load foreign content directly into the Canvas resulted for Chrome (and the tested other browsers) in the aforementioned "tainted canvas security exception" when trying to generate the dataURL from it. generating the dataURL form it. <image x="0" y="0" width="400" height="250"
This exploit can be performed completely without user interaction. 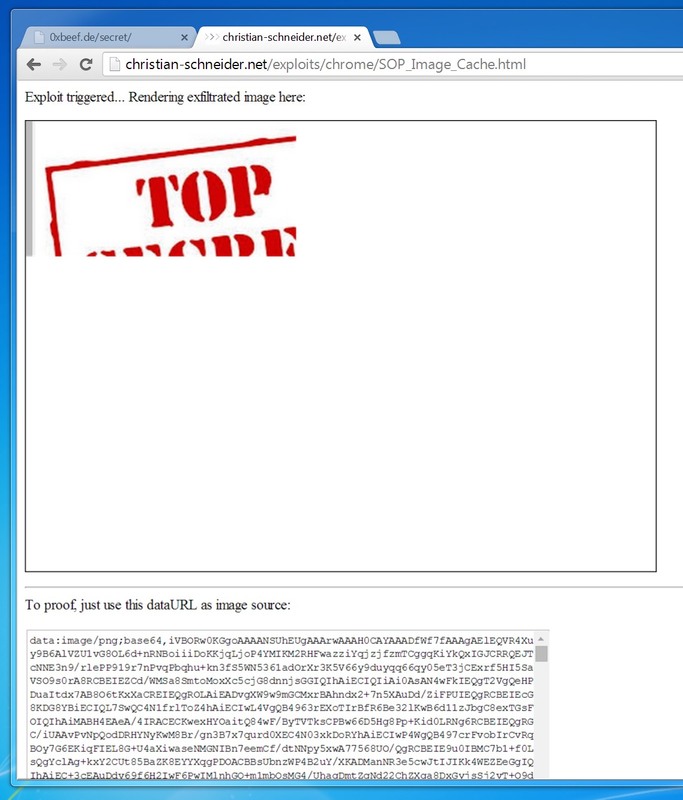 followed by "exploit step 2"
But unfortunately (from the view of an attacker) this was also checked by Chrome: The try to exfiltrate the image's visible content by converting the Canvas (indirectly tainted by SVG with a cross-origin image) into a dataURL was prohibited as a violation of the SOP! What if the source of where the content to exfiltrate comes from is not directly the foreign origin? What if the image is fetched from a browser's cache instead? That was my final ingredient for the SOP bypass exploit to exfiltrate images! So I slightly modified my malicious webpage by adding a loading of the SVG as a regular <object> embedded content before the SVG is loaded (this time from cache) during the exploit's action. The embedding of the SVG via <object> before was simply to populate the cache before the exploit runs, so that the tainted checks eventually will see the image in the SVG coming from the browser's cache instead of a foreign origin and thus allow us to exfiltrate it "via SVG via Canvas via dataURL". Finally that did the trick and the result was the successful exfiltration of images cross-origin in Chrome. The images are loaded with all authentication data in place, so cookies and HTTP auth is kept intact, allowing to exfiltrate secret images from users logged-in somewhere (like private photo albums, etc.). I also successfully exfiltrated an image attachment of a mail via Gmail webmailer. 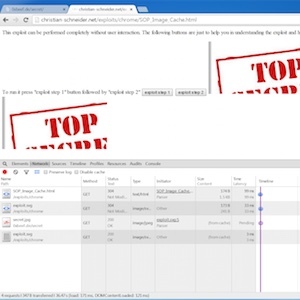 Another exploitation scenario is for the attacker to check whether the victim is logged in with some sites or not in case they serve certain images or not depending on the logged-in state. Please note that the images were required to not have anti-caching headers for the exploit to run. In other words: Serving (at least secret) images with proper anti-cache headers prevented the exploit from an application's point of view. From this point on I had found what I was seeking: A SOP bypass in Chrome. I reported that to Google's security team as bug ticket 380885 along with a working exploit on two of my domains: The exploit hosting code is still there (referenced from within the ticket), so that anyone interested in browser security can use this as a quick testcase... Google fixed it in version 36.0.1985.125 of Chrome for Windows, Mac and Linux and assigned the CVE-2014-3160. State before pressing "step 1"
State after pressing "step 1"
State after pressing "step 2"
Google Security rewarded the responsible disclosure of this Chrome vulnerability along with a fully documented working exploit with a bug bounty. Thank you very much Google! As always think outside the box and try to combine different tricks and techniques to get the full working exploit. As done here with the fact that images can also be loaded indirectly via SVG and when combining this with browser cache to reset the tainted flag, it was a successful end-to-end SOP bypass for exfiltration of secret images in Chrome. At first sight this was more of a browser vendor issue than an application developer's. But nevertheless it shows how underestimated recommendations, like using proper anti-caching response headers for sensitive content, can sometimes prevent successful 0day exploitation, as was the case with this SOP bypass: I've successfully tested that images with proper anti-caching headers won't get exfiltrated that way (as the cache requirement for resetting of the tainted flag was no longer met).